In companies, people are given specific roles to carry out, be they in engineering, marketing, sales, finance, accounting, product management, etc., but to carry out these roles there must be close interaction with other people and organizations to be effective. With close interaction, the opportunities for conflict are high. A healthy tension between organizations can actually be good, as it can ensure that all sides of an issue are properly represented. However, some conflicts can turn a healthy tension into an unhealthy tension, where people take actions that work against the company’s best interests. Sometimes this is inadvertent (“I thought I was helping and didn’t realize what I was doing would mess things up.”), and sometimes it is purposeful (“I’ll show him not to mess with my turf.”). Reducing tensions or keeping them healthy is a critical role of management and something all members of the organization must be mindful of. What should be done when company “families” become dysfunctional? As with many problems in life, first you need to recognize that you have a problem, and then work to make others recognize that the problem exists. This is often half the battle. The importance and impact of the problem needs to be brought to the attention of management. People up the management chain then need to recognize that the problem is serious and that something needs to be done to correct it. If people refuse to recognize the dysfunctional behavior or to ignore it, hoping it will just go away on its own, then the problem will fester and grow. Once it’s recognized that there is a problem, then an action plan to address it needs to be developed. Most often, this is getting the people showing the dysfunctional behavior together and explaining the problem and getting them to work on fixing the problems. Facilitation is most often required; someone without a stake in the problem can help the parties involved to find ways to correct the problem that are mutually beneficial. More often than not, problems result from a lack of communication and the first sincere discussion of the issue produces surprising results. If people are not working well together, then they need to define ways to be more effective together and start working in that fashion. Understanding each other’s needs and viewpoints is often a good place to start. If people are stepping on each other’s turf, then roles and responsibilities of each need to be more clearly delineated and how they can interact effectively. When it is clear what your job is and what the other people’s jobs are, it is much easier for you to concentrate on doing your job, and to let others concentrate on theirs. This doesn’t mean operating in isolation, but recognizing who is responsible for what. If people are working entirely in islands of isolation without interactions, then joint areas of essential interaction need to be defined. People generally can’t work effectively in total isolation, and they need to be able to recognize this. If people are at each other’s throats, then they have to be told to play nicely together or one or more of them may not be allowed to play at all. If people’s egos are getting in the way, then they have to be told to leave their egos at the door and work together. The company is not there to satisfy their egos, but for them to do their jobs for the benefit of the company. In general, the source of the dysfunctional behavior must be clearly identified and a plan of action must be developed to attack and eliminate it. For a company to succeed, the company “family” must succeed. It is critical that all members of the “family” pull in the same direction and work cooperatively to achieve the company goals (see Keep Your Eyes on THE GOAL!). 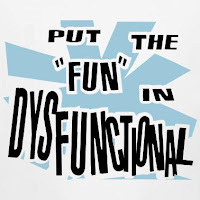 For company success, “dysfunctional families” are not allowed. EXCELLENT posts here. I just left a very dysfunctional small company. You are right on with all you say. Cheers! Keep on bloggin'. Thank you for your kind comments. 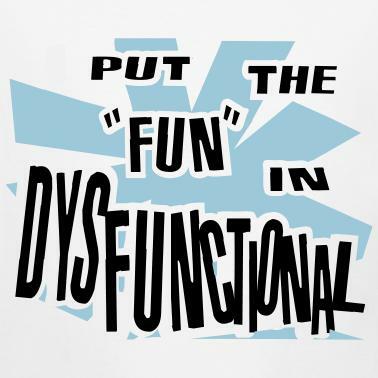 There are far too many dysfunctional companies (and organizations within companies) out there. At least we can learn, to some extent, what to look for (or look out for) in the next opportunities we pursue, to hopefully avoid new dysfunction. If there is anything I can do to help you, please let me know.